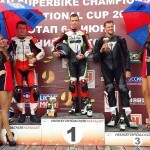 The second stage of the Russian Superbike Championship took part in Nizhniy Novgorod, 7th of June, circuit NRing, together with the 3rd stage of Russian Supermoto Championship. 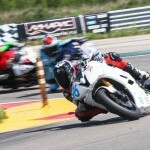 Russian motorcycle rider Makar Yurchenko showed a fabulous result in the Supersport EVO2 class under the umbrella of the DMC ЦСКА team, and got one more main podium in his career, showcasing the excellent preparation for the competition and a severe battle with the leaders of Supersport higher class. 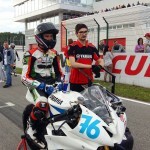 Makar Yurchenko: “This weekend was a kind of minimarafon for me. I participated in three classes at the same time: Supersport EVO2 (RSBK), Supermoto and Minimotard. It was the first time for me to combine three races and to jump from one different bike to another one and all in one day – that was something new for me! It was not easy, but very interesting. I performed in RSBK in the class EVO2, but nevertheless I could catch the top riders from Supersport”. 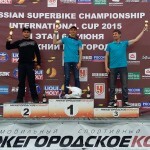 On the 3rd stage of Russian Supermoto Championship a 16-year old Makar Yurchenko also got a victory – the third consistent victory in the championship this year, and kept the leading place in the competition for his team AvtoMotoAlians. His team mate Artiom Teslenko crossed the finish line on the 3rd position. In the Russian Minimotard Championship Makar Yurchenko settled the second best result and commented on his result like “one meter to the victory“. The next stages of Red Bull MotoGP Rookies Cup are planned for 26-27 June, and will take place in Assen, Holland.